CNC machining is the backbone of many manufacturers’ processes. Unfortunately, they are also a major cost center and can be a bottleneck when it comes to getting the product quickly through the plant. Far too often we find that a company has invested in quality inserts and tooling, but is not running them at the proper feeds and speeds. 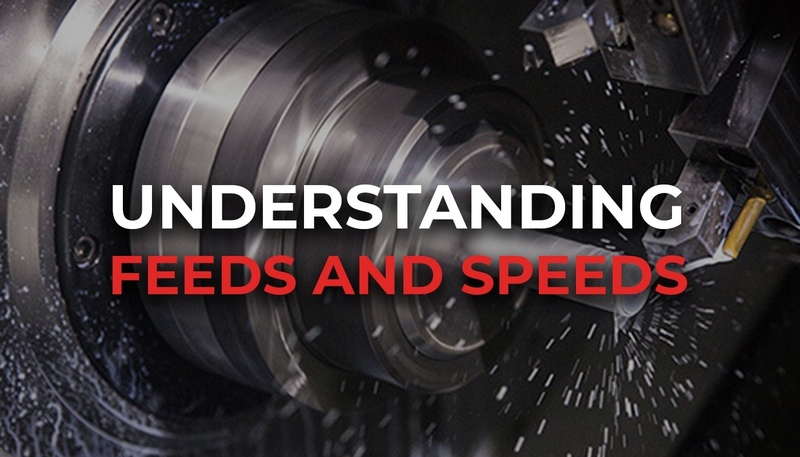 Feeds and speeds refer to two separate velocities for machine tools: feed rate and cutting speed. They are often considered as a pair because of their combined effect on the cutting process. Cut speed (or surface speed) is the speed at the outside edge of the part as it is rotating. It is expressed as a unit of distance along the work piece surface per a unit of time. Cutting speed is the speed that the material moves past the cutting edge of the tool. Cut speed can be defined as revolutions per minute (RPM) or as surface feet per minute (SFM). Revolutions Per Minute (RPM) relates directly to the speed, or velocity, of the spindle. It represents the number of turns completed in one minute around a fixed axis. RPM maintains the same revolutions per minute throughout the entire operation. When the diameter at the beginning and end of a cut only differs slightly from the beginning. Surface Feet Per Minute (SFM) is a combination of the cut diameter and RPM. The faster the spindle turns, and/or the larger the part diameter, the higher the SFM. For example, if two round pieces of different sizes are turning at the same revolutions per minute, the larger piece will have a greater surface speed because it has a larger circumference and has more surface area. As the tool gets further into a workpiece, the same spindle speed will produce a decreasing surface speed. This is because each revolution represents a smaller circumferential distance, but takes the same amount of time. Most CNC lathes have Constant Surface Speed (CSS) to counteract the natural decrease in surface speed. This speeds up the spindle as the tool moves closer to the turning axis. By utilizing CSS the lathe is adjusting the revolutions per minute to maintain a constant surface speed at every distance from the center. When the diameter at the beginning a cut will differ significantly from the diameter at the end of the cut. Better tool life and machining time because tools will always cut at the appropriate speed. Feed rate is the velocity at which the cutter is advanced along the work-piece. Feed rate is expressed as units of distance (inch) per minute or per single revolution. Feed rate can be defined as an inch per minute (IPM) or inch per revolution (IPR). IPR is more commonly used. Cutting tool selection has a direct impact on the proper programming of feeds and speeds at the machine. Cutting tool manufacturers publish the general feeds and speeds and recommended usage for the application. That is often a good place to start for recommendations on tool selection and feeds/speeds, but best practice is to work directly with a cutting tool expert at your machine. 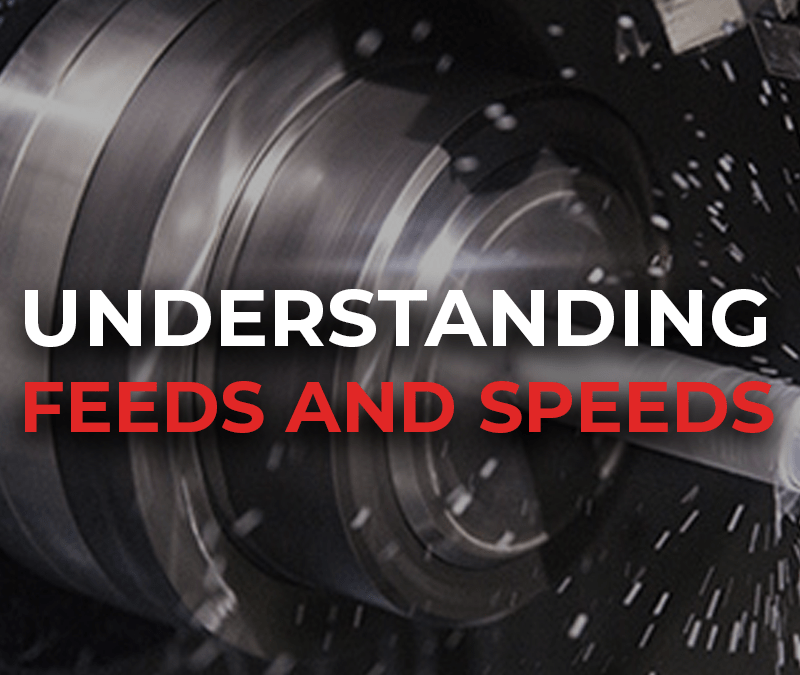 At Martin, we pride ourselves on understanding feeds and speeds and optimizing them for our customers. Give us a call today and learn more about how we can help you maximize the profitability of your machine shop.